This is Queer Voices on KPFT and this segment is called Queer Music Heritage. I'm JD Doyle and tonight I'm bringing you two very special interviews. The first is with Char Priolo who in 1977 founded a good-time rock & roll lesbian band called the Fabulous Dyketones, and in the second half of the show you'll hear from one of the movers and shakers in the genre of gay & lesbian chorus music, and he's also brought us a number of gay musicals. He is director, composer and songwriter Eric Lane Barnes. But first, on to the Dyketones. Let me set the stage for you. As you heard in the openly song their shows take place at Dyke High, and some of the group members might be wearing leather jackets and white tees, with their hair slicked back greaser style, and others might don poodle skirts and bouffant wigs, in a whole campy incarnation of 50s butch and femme. They took on stage names like Bobby Sox, Penny Loafer and Chukki Linguine. And it all worked. What started out almost as a lark has lasted now into their 29th year, and along the way became a lesbian institution. To anyone who has spent their summer vacation in Provincetown during the last couple decades, they know the Fabulous Dyketones. The music you'll hear during the interview comes from their only commercial release, called "The Fabulous Dyketones: Live in P-Town," from 1988. So I'm very pleased to share with you an interview with the founder of the group, Char Priolo. How did the Fabulous Dyketones get started? you know, the Cleftones and the Harptones, so it was just kind of word play. So, when we put those two things together, the social club looking for a band, and us having fun messing around with the old songs, well we decided, maybe let's go for it. Well, this was in November that this all happened, so by the end of December for New Year's Eve, we knew six songs, and we played, we actually did play for the party and since our repertoire was so short we did all of them three times each, we did the whole set list three times. So, how did the show go over? it was a most pleasant surprise. I think for everybody there. Did you become the Dyketones right away then, as far as an organized group? Well we did that project, and then we didn't do anything at all for about six months, and then in July there was a women's music festival at Evergreen College in Washington State. By the time we did the July following, and that would have been in '78, the women's music festival there, we had the instrumentation one needs for a rock & roll group. We had drums and a bass, lead guitar, bass guitar. By then were you the "Fabulous" Dyketones? No, we weren't the Fabulous Dyketones until 1984, which was our second year here in Provincetown. What we would do at the end of every show was just run down the center aisle of the venue to the back of the room and then form a reception line to just thank people for being at the show as they left. And they would come through and say "This was fabulous, you were just fabulous," and over and over people would say we were fabulous, so we just started saying, "That's because we're the Fabulous Dyketones. Did that name cause you any problem getting bookings, the Dyketones name? Yes, later on when we were coming across country that's when the name started being troublesome, because here (Provincetown) is a gay and lesbian mecca, so it's safe here but the minute you left, when you were out of that and we would try to get into anything else it was troublesome. And people would always tell me, as the booking agent, and as the band leader, even if we were actually in the middle of doing a gig, on a break or something. They'd say, "You know, you are really, really good and you'd go far if you'd must change your name." But the whole point was to be who we were and to actually pioneer what we believed was right. And the more we played, the more older lesbians would come up to us at the end of the show, with tears, you know, just quietly coming down their faces, say things like, "This was my music when I went to school, and later I couldn't dance to my own music with my girlfriend, and now, I can." And it would give me chills. In fact it just did again when I told you. [Well, you helped them reclaim their music] Yes, and I did it for me as well because it was my music too. I've read that some of your fans would see the shows over and over. we had a six-day run, we had one night off. They would come six nights out of six and brings friends each time. It was really, it was really something. Did the band perform all year, or just in the summer or what? We performed six nights a week in the summer, and then I would tour us back to the West Coast to San Francisco or Portland, Oregon. And then you moved to Provincetown for good? In '87, yeah, my partner at the time was the drummer and I said, "How do you feel about just staying here. I can put the band together from here instead of from the West Coast and then tour out here," and she thought it was a great idea too, so, that's what I did that year. How many Dyketones have there been? Ah, up through '03 there have been 79 Dyketones. what crossed the line to make if official for a person? Just that they played. There are some people that just stood in for one night or one show, but they still had a stage name, a Dyketone name, and so they are still in the roster. Over the years about what percent of the members have been lesbian? I would say, 98%. We actually had one resident Dicktone. They have websites, yeah, Brenda Lyons, Amy Roberts, Betsy Sykes, Brianna Caton, Robin Borthwick [yeah, she's the current drummer] and Sherry Hackney Cade, and the Therapy Sisters. Yeah, the Therapy Sisters are my two guitarists right now. you know, sort of in the group? and Robin Borthwick is from Houston. [Actually I've met her] Yeah, she's the current drummer. And Melissa Sigler is now residing in Nashville and she's the current keyboardist. Over the years how did your audience change, or the reception you received? Yeah, yeah, and when we don't play, if there's a year we don't play, like this one, people actually miss us and corner me on the street and say, "Why aren't you guys playing? What's going on?" And so I always have to let them know we'll be back, we'll be back, we're just taking a break, or whatever the story is. So the group is not ended? what do you think the group's contribution has been to our culture? I think that we laid some groundwork for other lesbians because when we did it, we never knew if there was going to be hostility toward us or not. And perhaps that's the case for some women now, but I doubt that it could feel the way it felt to us back then. And we were the first Out lesbian band. We were contemporaries to Alive, out of Oakland, California. [Yeah, with Rhiannon] Yeah, but they weren't out. And groups like Fanny and so forth, they weren't singing songs that were out either. But they didn't sing lyrically lesbian material. You're right. You're right. We did things like take the oldies and change all the pronouns. Yes, those are my favorite songs from the CD, like "My Girlfriend's Back," and "She's So Fine." Any favorite memores of the whole 28 years or whatever? Exactly, exactly. And young women who have bands have come up to me and said, "You know, you were the first dykes I ever saw, and I'm doing it now." And you know we get these thanks in different ways so many times, and even if it's way in retrospect it lets me know I was doing the right thing and when I believed that I was right. And this is a good time to invite you to check out my website, at www.queermusicheritage.com. If you visit it while you're listening you can see the playlist and follow along, while looking at photos of the artists and recordings. I've always considered our music history as a visual as well as an audio experience. Also, for more very queer programming, please listen to After Hours with Jimmy Carper, every Saturday night from midnight to 4 am, on KPFT, it's Queer Radio, with attitude. The Fabulous Dyketones. And you should recognize this next song immediately. Of course that's the Beatles song "This Boy" and its done by a small ensemble of the Seattle Men's Chorus, called Captain Smartypants. Last year they released a CD called "Undercover." And the director of Captain Smartypants is the subject of my second feature interview for this show. Eric Lane Barnes has a quite a resume. He's worked with the Windy City Chorus organization in Chicago. He's currently assistant director of the Seattle Mens Chorus, and has done a number of commissions for gay choruses around the counrty, and he's written a number of musicals. It's through these musicals that I first became a fan. For a number of years one of our best Houston theatre companies was Theatre New West, and its director Joe Watts mounted a very successful run of a musical called "Fairy Tales" several years ago. And three years ago came "Fruit Cocktail," and in 2003 was one called "The Stops." All of these were written by Eric Lane Barnes. So it was only natural that I would want to talk to Eric about his various projects. I'll start off with the newest one, with the group Captain Smartypants. Tell us about Captain Smartypants. Captain Smartypants is a vocal ensemble of nine homosexual men and we've been described as the illegitimate love child of N'Sync and Monty Python and we pride ourselves in making delicious harmony and making audiences sick with laughter at the same time, and that's not an easy feat. We recently put out a CD called "Undercover," which is cover tunes of pop tunes from the 70s through 2004. "Fernando" is on the CD as is Rufus Wainwright's "Vibrate" and "Big Yellow Taxi," "Killing Me Softly," three songs by Cher. It's gay on one hand but on the other hand it's just fun pop music, but I guess it's okay to be fun and pop and gay all at the same time. How did y'all pick the songs for the Captain Smartypants album? if not a specific gay sensibility, we wanted them to at least be able to be put into a gay context, like "This Boy," the Beatles song. You know, the Beatles, of course the gayest thing about the Beatles was their manager. But the words so read like a gay song. "Xanadu"
] I know, I know, that's the thing. You try to do a song like that, and it's impossible to do it better, and so we went through that one a couple times, and went, eh! This isn't going to work, and a friend of mine recommend "Use Me," by Bill Withers, and I made a fun arrangement of that. Tell me about "Suddenly Seymour"
Well, Okay, the reason that's on the CD is that we had done a Broadway show last Spring, and we wanted to find some tie-in between that show and the CD, because we knew that the CD would be released at the time of the concert, and we wanted to be able to sell CDs, and link it to the concert. And it worked, we sold a couple hundred during the concert. well, we kind of all agreed that he shouldn't sing Audrey's lines up in Ellen Greene's range, cause it would have sounded really weird. And so we just had him sing really breathy and really girly, and maybe it's because I can picture Mark in his costume, cause he did the whole leopard print, tights and high heels, and you know, big blond hair and everything for the show. But when I hear the song on the album, I picture Mark as Ellen Greene as Audrey. Tell me about "Vitamin Q"
it kind of goes through the story of questioning "is there something wrong with me, is there something wrong with me?" And then realizing "No, there's nothing wrong with me, and all I've got to do is just be myself." And then you tie it into, and that's why we're here cause we like to share who we are with you. Now I better pause and give a little bit of your background, cause we kind of skipped over it, what did you do in Chicago? 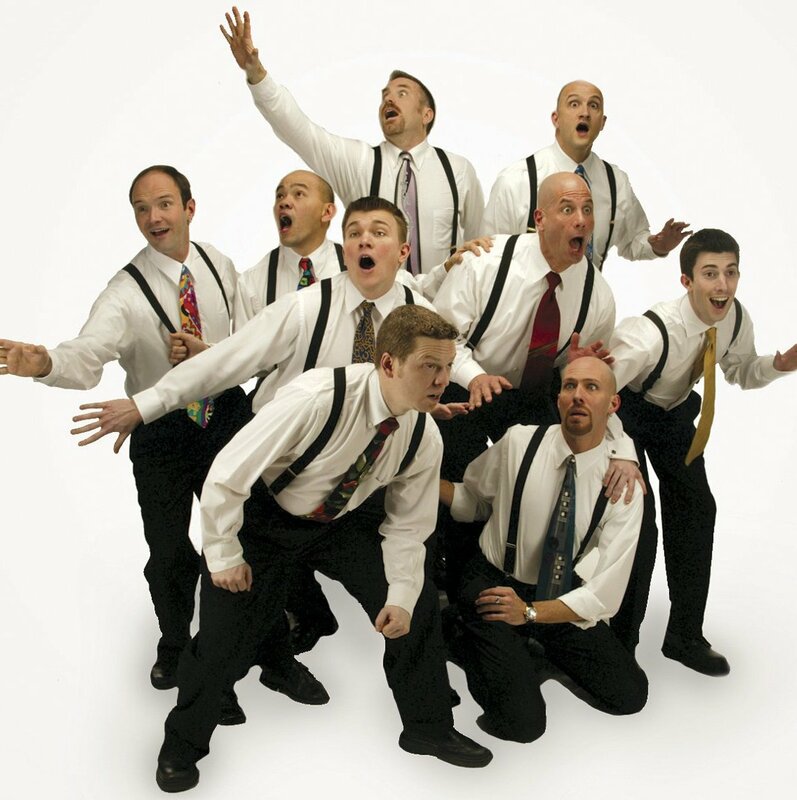 I worked for the Windy City Gay Chorus and I took over the direction of the Windy City Slickers, which was a vocal octet. And after the first year of directing them I formed a women's group with the same organization, cause they had both a men's chorus and a mixed chorus. And so for '95 through '99 I directed those two groups with Windy City, and prior to that time I had done a lot of stuff as a musical director of cabaret shows and musical shows working in both equity and non-equity houses, and had been doing more and more of my own like cabaret shows. So I came to the Windy City groups with a lot of musical theatre background, and having written a lot of stuff and so I figured, well, I'd just write stuff for these groups and see how that flies. And it worked out pretty well. And you've done a lot of commission work too for a variety of groups. Yeah, lots of choruses because the GALA chorus network is pretty tight. And for those who don't know, GALA Choruses stands for Gay And Lesbian Association of Choruses. The umbrella organization is bout 25 years old and every four years there's a GALA festival where all the GALA Choruses converge on a town and for a week, we perform for one another. And it's a huge thing; it's like anywhere from five to eight thousand people that are participating in this. And when I went to my first GALA festival, that first year that I was directing with Windy City, I realized that there is a huge niche here of music to be written for this gay chorus movement, so I set out to appeal to other GALA choruses and kind of built up a cottage industry of writing new songs for choruses and also licensing the songs that I'd written for other choruses. And what got you to Seattle? Ah, the director of the Seattle Men's Chorus had seen me in Chicago with the Slickers and with the women's group, Aria, which is the women's ensemble there. I had met him in Dallas at a music director's conference, and Dennis Coleman, who'd the Director of the Seattle Men's Chorus, is looked up to as the best gay men's chorus director, and that's because of the huge success of the Seattle Men's Chorus. And I asked him if I ever would move to Seattle if there'll be work here for me, and he seemed to think there would be. And so it was about a year after that he talked to me and asked me if I was serious about moving to Seattle and I said, yeah, I'd consider it. He then contacted me a little bit later and said that they were creating a job and he wanted me to apply for it. I applied for it, and I auditioned for it, they hired me and here I am. In 2001 the Seattle Mens Chorus released a CD called "Fruit of the Month Club" which included Captain Smartypants doing the song "Available," and I asked Eric about that next. Now many of Eric's songs have shown up on various releases, but that's not true of the songs from the production called "The Stops," which was produced in Houston in 2003. Now, "The Stops," I haven't heard those songs anywhere else. Yeah, they're kind of specific to that show. It's kind of hard to take those out of context. Tell me about that production. The premise is three ladies, three organists, three lady organists who meet and decide to put together a show and take it on the road. And as they're performing their material, they discover that their favorite organist and Christian songwriter is gay. And how they deal with that knowledge is basically what drives the engine of the show. All the songs are written as if they were written by this character, whose name is Dale Meadows. He's a fictional person. There is no real Dale Meadows. It was really fun writing songs deliberately cheesy. Before we leave "The Stops" I'd like to hear about "The Fundamental"
it's a very bitter song, but it's very cynical but it's so bouncy and happy that it counterbalances the bitter, hateful things that it says. We perform that actually with Smartypants, just because that song you can take out of context. You can sing about Fundamentalism and pretty much anybody these days will get the joke. Unless you're a Fundamentalist, because Fundamentalists generally don't have senses of humor, especially when it comes to religion. I heard a comedian say, "have you ever noticed that people that are so eager to tell you about their religion never want to hear about yours. That was "The Fundamental" and before that "But You Are Blanche" and those versions come from the Houston production of "The Stops," from 2003, and were sung by Robert Leeds, Michael Harren and Chris Pool. "Blanche" by the way, has never been recorded anywhere, and I want to thank Director Joe Watts for allowing me to share those with you. Now, I mentioned earlier that before he moved to Seattle, Eric worked with the Windy City Chorus groups in Chicago. In that capacity he directed their group called Windy City Slickers. They released an album in 1999 called "Sunday," and the last two songs we'll cover on this show come from that CD. Tell me about the song "Your Man"
I don't know, would you say it's doo-woppy? It's not really doo-woppy. It's basically taking movie images, things from movies, the way that men are in movies, and saying, I don't want to be that, I don't want to be that. I just want to be your man. I just want to be your lover. Now, I've got one more song to share with you, but before I get to it I want to thank you all for listening, and to thank Char Priolo from the Fabulous Dyketones and Eric Lane Barnes for their interviews. And, as always if you have questions or comments about any of the music I've featured, please write me. And I wish you would. My website, of course is at www.queermusicheritage.com. This is JD Doyle for Queer Voices on KPFT in Houston. Okay, we were talking about the album "Sunday" by the Windy City Slickers, and I just had to hear about the song "Drama Queen"
Based on a true story. I think everybody can relate to someone being a drama queen, someone who is taking a small situation and blowing it hugely out of proportion, or somebody misunderstanding a small word or something, or somebody who just absolutely has to have their way and has to have everything revolve around them or they throw a fit. And it just basically tells about the history of a person growing from a child drama queen into an adult drama queen. We sing it very seriously, with big Norma Desmond eyes, and the time that we performed it that it was the most fun we had footlights. The first time we sang "cause I'm a drama queen," when we sing "drama" the footlights come up and there's a scythe behind us and you know, the light coming from below and then the huge shadows on the scythe, it was just a sight to behold.